Posted February 28, 2017 by Tidewater Tech & filed under Welding. Posted February 24, 2017 by Tidewater Tech & filed under Trade School. 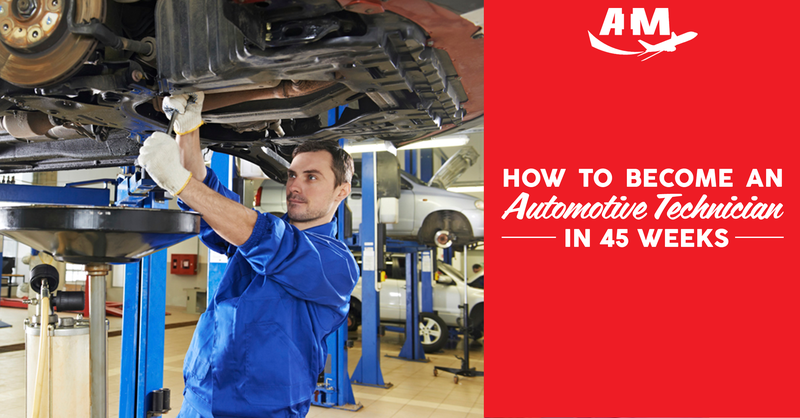 Posted May 18, 2016 by Tidewater Tech & filed under Automotive Technician, Career Training. Posted December 15, 2015 by inetmgraim & filed under Adult Education. Posted November 13, 2015 by inetmgraim & filed under Career Training, Trade School, Welding. It’s been almost a year since Tidewater Tech obtained the coveted American Welding Society’s (AWS) “Accredited Test Facility” designation and the future couldn’t look brighter. 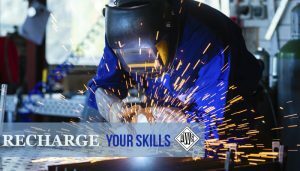 Not only are students earning two internationally recognized welding certifications, they benefit from the AWS endorsement of our facility when seeking employment. Posted April 10, 2015 by Randy Soriano & filed under Career Training, Certifications, Community Service, Uncategorized. 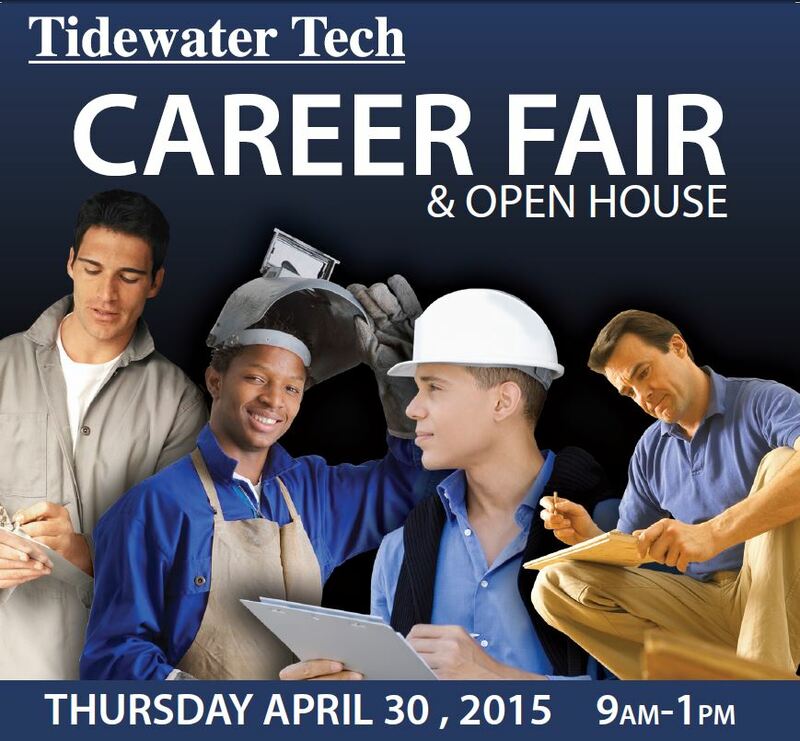 Mark your calendars on Thursday April 30th, 2015 Tidewater Tech will host our Career Fair Open House from 9am to 1pm. Check out who’s hiring in the Hampton Roads area in both trades and general business . Companies such Wells Fargo, One Hour Heating and Air, Aerotek, Harbor Group, Mile One/ Hall Automotive, Oceaneering, and Snap On Tools will be in attendance for onsite interviews. Our open house is a free event and open to the public. Recent grads? We’d love to here from you. Come Join us at Tidewater Tech’s Annual Career Fair and Open house. Download and view our official event flyer here. Posted March 9, 2015 by Randy Soriano & filed under Certifications, Welding. Posted March 6, 2015 by Randy Soriano & filed under Certifications, Trade School, Welding. Posted March 5, 2015 by Randy Soriano & filed under Certifications, Welding. Posted December 22, 2014 by Tidewater Tech & filed under Uncategorized. The American Welding Society (AWS) completed their visit at Tidewater Tech Trades making it the first Accredited Testing Facility in Virginia. Students and community members can now receive their welding certification at Tidewater Tech Trades. Students, prior to graduation, take their AWS Shielded Metal Arc Welding certification in the 3G (horizontal) and 4G (overhead) positions. Students are also able to receive their Flux Core Arc Welding qualification in the same 3G and 4G positions. 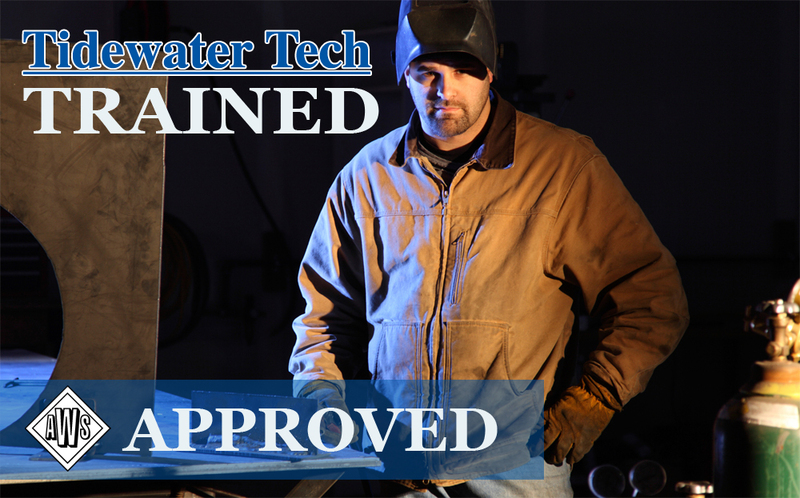 The certifications and qualifications that students receive are excellent indicators to employers that Tidewater Tech Trades welding graduates are able to start employment with little additional training. This also shows potential employers that Tidewater Tech Trades graduates are serious about their future endeavors as combination welders. 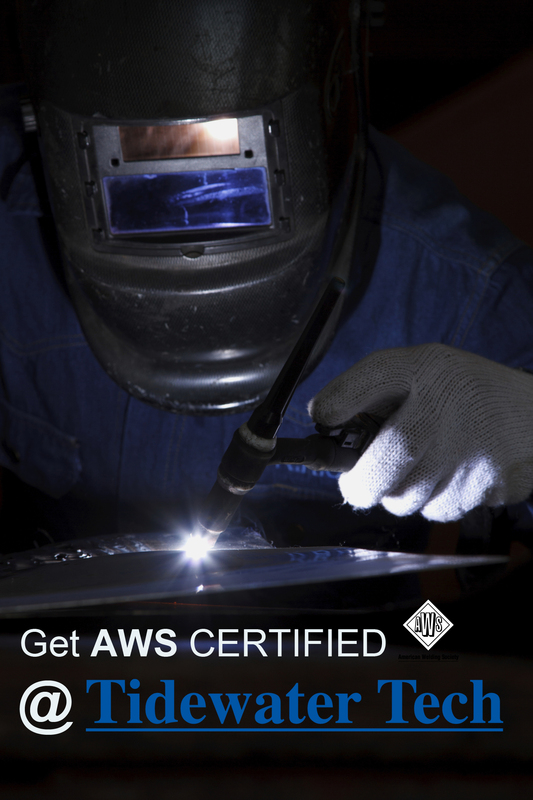 Community members can also receive their AWS welding certifications and qualifications by completing one of Tidewater Tech Trades 30-hour welding refresher courses. Prior to receiving their certificate of completion, these students will take the AWS test. Mr. Arthur Dwyer, Combination Welding Coordinator and Certified Welding Inspector (CWI), has brought this campus to the lead of all other trades schools in Virginia. Being recently published the in AWS journal, Tidewater Tech Trades has received numerous calls from companies looking for qualified welders and for a training institute for welding certification. 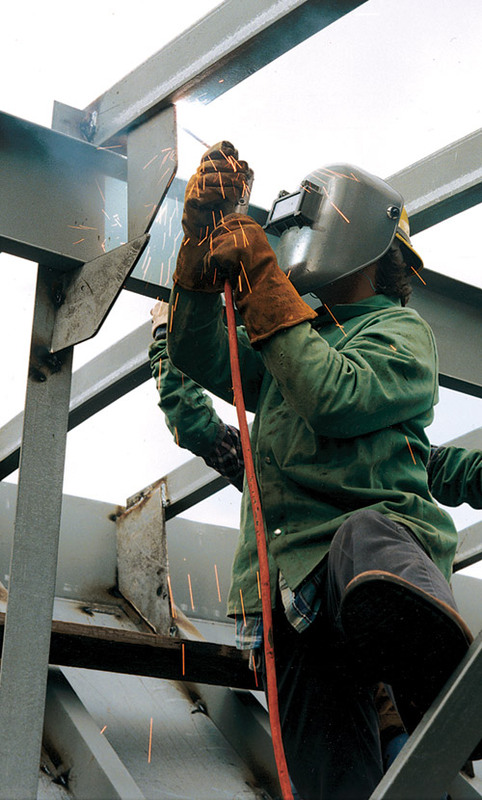 Military contract specifications require welders to be AWS or milspec qualified. 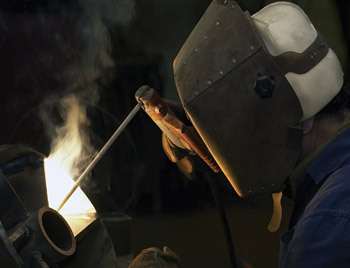 This ensures welds in all positions will successfully pass testing requirements whether by x-ray or other methods. Graduating students that leave Tidewater Tech Trades with SMAW certification and FCAW qualification have great self-esteem. These tests are very difficult and require weeks and months of practice and quality instruction to pass. 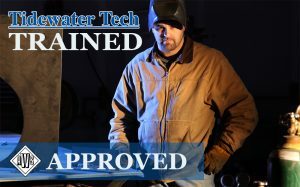 It is the dedication and leadership of the instructors in the Combination Welding department that has brought Tidewater Tech Trades to the high standards that many other institutions are trying to achieve.